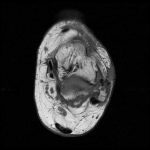 We present an independent case study of a 54-year-old woman that underwent arthroscopic ankle synovectomy with an open Broström lateral ankle stabilization who eventually suffered a spontaneous tendon rupture of both the extensor digitorum longus (EDL) and extensor hallucis longus (EHL) during the post-operative period. Though the postoperative course was initially uneventful, the patient began experiencing pain and swelling about the ankle joint upon transition to full weight bearing three weeks following surgery, but prior to physical therapy implementation. She was subsequently diagnosed with a combined EHL and EDL tendon rupture as well as chronic tendinosis of both tendons. 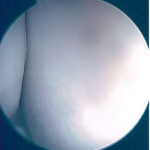 We present this case as a rare complication following arthroscopy directly related to chronic tendinosis, resulting in potentially detrimental implications during postoperative recovery period. 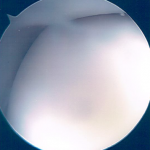 The incidence of tendon rupture following arthroscopic ankle intervention is rare. Spontaneous tendon rupture, with or without intervention, is uncommon. Generally, spontaneous tendon rupture is directly correlated with a combination of mild trauma and chronic degeneration of a tendon. Other contributing factors are systemic diseases, biomechanical abnormalities, fluoroquinolone use, and steroid usage. The Achilles tendon is the most common tendon to experience spontaneous rupture, followed by the patellar tendon, and the Tibialis Anterior (TA). Specifically, a pes planovalgus foot type can cause excessive recruitment of the muscles required for ankle joint dorsiflexion, the long extensor tendons and the TA. Concomitant factors such as ankle equinus and obesity should be considered during the preoperative examination. 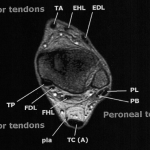 If tendon pathology is expected, a Magnetic Resonance Imaging (MRI) should be obtained. An increase in T2 signal intensity surrounding the tendon is consistent with tenosynovitis. Tendinosis, on the other hand would be delineated by tendon thickening on both T1 and T2 weighted images with increased T2 signal . If the MRI is contraindicated, an ultrasound is a viable option. 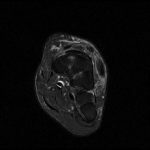 We report the case of a 54-year-old female, who sought a second opinion for continued lateral ankle pain and instability. She had an ankle MRI performed about one year prior to presentation and continued to have nearly daily recurrent left ankle sprains as well as constant aching left ankle pain. Pertinent findings on physical exam were a mild hindfoot varus deformity, a BMI of 40.4, intact manual muscle testing, lateral ankle instability, and tenderness on palpation of the lateral ankle including the anterior talofibular ligament (ATFL), the calcaneofibular ligament (CFL), and the sinus tarsi. After failing prior conservative treatment, surgical intervention was pursued via ankle arthroscopy and lateral ankle stabilization. Ankle arthroscopy was performed uneventfully through a standard anteromedial and anterolateral ankle portal. Postoperatively, she was placed in a posterior splint with the hindfoot placed in slight valgus position. The postoperative course passed uneventfully until the patient was transitioned from a posterior splint to an ankle brace weight bearing as tolerated one month postoperatively. She was instructed to use assistive devices as necessary and given a prescription for rehabilitative therapy. A few days following weight bearing, the patient noted sudden increased swelling surrounding the ankle joint, along with stiffness and burning within her first three digits. Radiographs and labs to rule out fracture, infectious or inflammatory process were negative. With clinical improvement, she proceeded to complete several weeks of physical therapy with resolution of ankle instability; however, in addition to stiffness and weakness of her lesser toes she began to complain of great toe weakness. An MRI of the left ankle and left foot was obtained approximately 3.5 months postoperatively. Imaging at the level of the ankle demonstrated a ruptured EDL and EHL retracting proximally above the tibiotalar joint without violation of the anterior joint capsule. MRI at the level of the foot demonstrated tendinosis of the same tendons distal to the level of the ruptures. In 2012, Zengerink et al reviewed complications in ankle arthroscopy. He found neurologic injury to be the most common finding, followed by infection in a review of 1176 patients. Zengerink et al reported no tendon rupture following arthroscopic surgery within their follow up of approximately 7.5 years . To our knowledge, there are only a small collection of prior reported incidences of tendon rupture following arthroscopy of the ankle joint. In 2010 Tuncer et al reported an incident of extensor hallucis longus and extensor digitorum longus insufficiency following radiofrequency ablation during ankle arthroscopy. Of note, intraoperatively both tendons were noted to be intact while the anterior capsule had been affected. However 10 weeks postoperatively, the patient did feel a “pop” and dual tendon rupture was then diagnosed . Single tendon rupture following ankle arthroscopy is a rarity. Rupture of two tendons simultaneously without consideration of iatrogenic injury is improbable. The initial MRI, performed in 2010 prior to any surgical intervention, demonstrated an intact EHL, EDL, and TA. To further solidify our findings of this rare complication, a musculoskeletal radiologist was consulted (Figure 1). 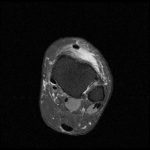 On MRI following any surgery, micrometallic debris can be detected in the soft tissues. This causes a susceptibility artifact in the tissues, which appears as multiple small foci of decreased signal on MRI. Figure 2 shows the metallic artifact surrounding the region of repair in the lateral ankle. No artifact is present in the anterior tissues surrounding the ruptured extensor tendons. Lack of metallic artifact as well as no anterior surgical track strongly argues against any kind of surgically induced laceration of the tendons. Figure 1 MRI of normal ankle anatomy. Figure 2 Micrometallic debris at site of lateral ankle repair. Figure 3 demonstrates thickening and increased signal intensity of the long extensor tendons distal to the level of the rupture, consistent with tendinosis. If the tendons had been lacerated during surgery, the cut edges of the tendons would be expected to be sharply demarcated without thickening or increase in signal intensity. Figure 3 MRI demonstrating absent extensor tendons at rupture site. 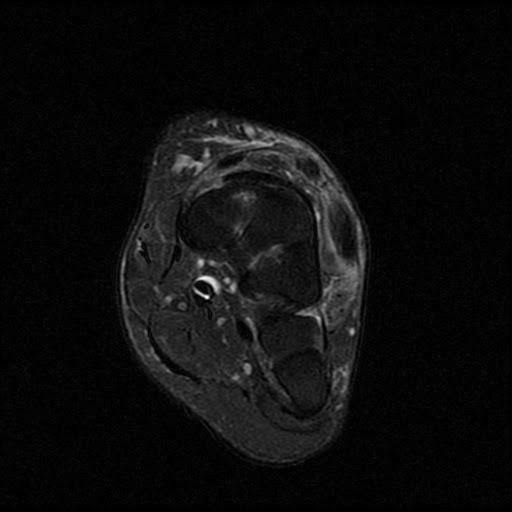 Figure 4 MRI demonstrating tendonitis distal to rupture. Figure 4 demonstrates the lack of the long extensor tendons near the level of the ankle joint. The TA has remained intact. Figures 5 and 6 demonstrate the intact articular surface of the lateral aspect of the joint showing no issues with ingress or egress flow allowing us to further conclude that the articular capsule remains intact. 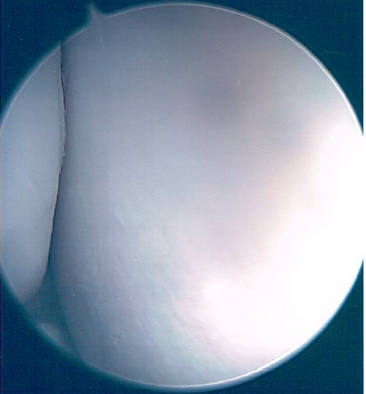 Figure 5 Intact intra-articular surface of the lateral shoulder of talus and fibula. Figure 6 Distal tip of fibula and lateral talus. If iatrogenic causes are ruled out, predisposing factors for tendon rupture must be considered. When an MRI is ordered for evaluation, chronic conditions can be missed as a result of being focused on acute pathologies. In general, chronic tendinosis and extensor tendon pathology are underreported in MRI reports . This patient had multiple predisposing factors for increased strain on her extensor tendons: morbid obesity with a BMI of 40.4, pes planovalgus foot type, equinus strain following immobilization from surgery, and recurrent ankle sprains all likely contributed to rupture in the postoperative period. Additionally, patients bear weight differently on weight-bearing joints following surgery. In the postoperative period, altered stress across the ankle joint in combination with a period of immobilization likely led to spontaneous rupture, due to the underlying tendinosis now appreciated on the postoperative MRI. 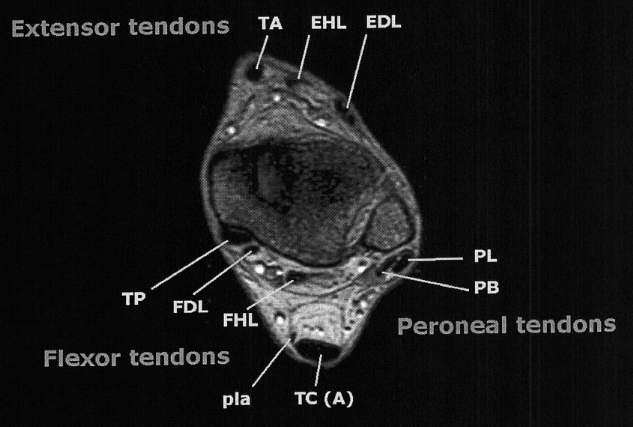 In addition to noted EHL and EDL tendinosis, there was noted metallic artifact lateral about the Broström site as would be expected, however, there was no metallic artifact within the anterior soft tissues surrounding the extensor tendons, nor a surgical tract from the ankle joint to the anterior ankle tendons. Spontaneous lower extremity tendon rupture, while rare, is a real possibility. We do not believe that the rupture of the long extensor tendons was due to iatrogenic injury. Rather, we believe that the combination of chronic tendinosis, immobility following surgery, and changing stresses on an already unhealthy tendon lead to tendon rupture as the patient’s physical therapy regimen was escalated. We believe that prevention of this hinges on proper diagnosis of chronic tendon pathology pre-operatively. When a patient presents preoperatively with gait dysfunction, a thorough evaluation of tendon pathology should not be overlooked prior to any surgical planning. Tsao LY. “Ankle Extensor Tendon Pathology.” www.radsource.us/ankle-extensor-tendon-pathology-2. Radsource MRI Web Clinic. July 2014. Zegerink M, van Dijk CN. 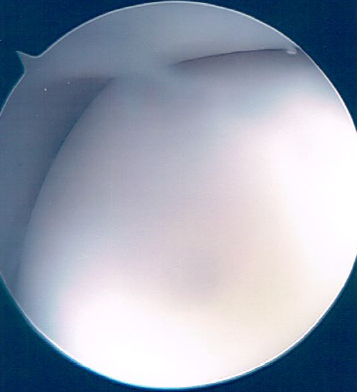 “Complications in Ankle Arthroscopy.” Knee Surgery Sports Traumatology Arthroscopy. 2012 Aug; 20 (8): 1420-31. Tuncer S, Aksu N, Isiklar U. Delayed rupture of the extensor hallucis longus and extensor digitorum communis tendons after breaching the anterior capsule with a radiofrequency probe during ankle arthroscopy: a case report. Journal of Foot and Ankle Surgery 2010; Sep-Oct; 49(5).